Email marketing needs to be your number one priority as a marketer. Why? Because out of all the possible activities you do to engage your audience — like posting on social and advertising — it’s the only one that you own. Facebook, Twitter, Instagram, YouTube, and all other social media (which includes advertising in them) aren’t owned by you. If these services decide to close, your 30k followers on Facebook will be worth nothing. But if you have an email list of 30k, you would still have access to them. Growing your email list, however, is almost always not a priority for marketers in the Philippines. Sadly, the current standard is growing your marketing reach. Hopefully, these statistics will encourage you to start growing your mailing list. #1 Three-quarters of companies agree that email offers “excellent” to “good” ROI. Email is not going anywhere. We have all seen how social media come and go. But email has always been there. 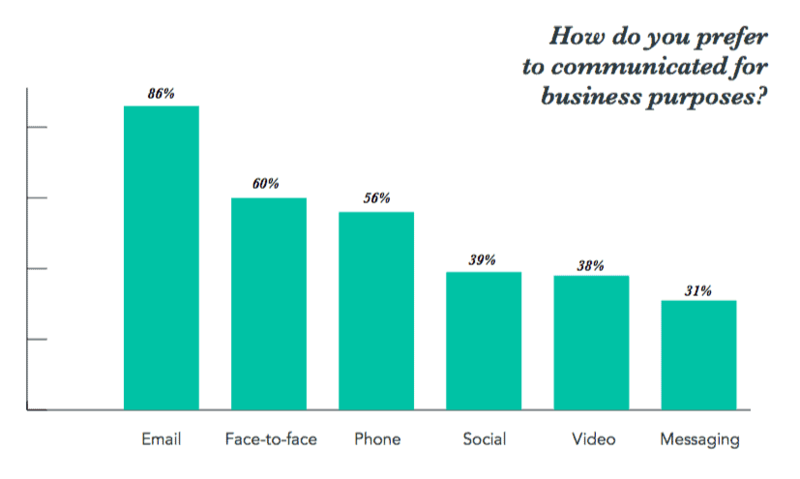 #3 86% of business professionals prefer to use email when communicating for business purposes. Yes, that includes social media, telephone, and face-to-face meetings. #4 80% of retail professionals indicate that email marketing is their greatest driver of customer retention (the next closest channel? Social media, identified by just 44% of those same professionals). Reaching customers via social media is difficult. With email, you get access to their inbox directly. With social, you have a lot of competition for their attention. Most people using Facebook or Instagram aren’t there to check your company. They are there for their friends and families. But when they check email, they are already conditioned to hear from other businesses (aka you). One of the biggest reasons why marketers don’t succeed in email marketing is because of unsegmented email lists. This results in generic, untargeted messages. If you think about it, it’s easy to understand why this doesn’t work. Imagine this: a person recently signed up for your newsletter because she liked what she was reading on your blog. Then, the next day, she receives an email about your awesome product. In 2 days, she received another promotional email. And again. And again. That person subscribed to read your blog’s content. But then you keep sending promotional emails that isn’t relevant to her. #6 Segmented email campaigns have an open rate that is 14.32% higher than non-segmented campaigns. Click-throughs are 100.95% higher in segmented email campaigns than non-segmented campaigns. This is another reason why you need to have a proper lead management strategy in your email marketing. The example above could be easily avoided if she entered a “segment” in your list as a new lead. From here, you can send a welcome series sharing the story of your company, your vision, and the challenges you’re facing. Then, in that final welcome series, you asked the person if she’d like to receive promos from you. If she said yes, then you’re messages won’t be seen as irrelevant. And to be clear, only those who said “yes” to receiving promos from you should be the only ones receiving them. Integrating your website with your email marketing software is key to tracking the results of your email marketing. If you don’t have this setup properly, it’s difficult to do remarketing or use automations based on behaviors. Here’s an example where this might be put to use effectively: a person is already a part of your mailing list. Recently, he keeps on viewing your pricing page. If you setup the integration properly and created an automation, this behavior (say viewed example.com/pricing >5 in the last 7 days), an email could be sent asking if he found what he was looking for. This timeliness is said to be one of the biggest drivers of closing a deal. #8 28% of consumers would like to receive promotional emails more than once per week. While people may say they like receiving these promotional emails, it’s best to test if they are acting upon it. When asked, 68% say they prefer to receive HTML emails (fancy, designed templates) over plain-text ones. But, data proves that HTML both decreases opens by as high as 37% and clicks by 21%. This behavior is apparent when using surveys. So, it’s up to you to determine what really works. #9 Digital shopping cart abandonment rates are high worldwide, at 74.3%. according to Q1 2016 research, with Asia-Pacific having the highest rate at 75.9% and Europe having the lowest cart abandonment rate at 71.5%. If you’re an eCommerce company, make sure you use this type of email in your email marketing. On the other hand, if you are not selling online, you should still send different types of emails like welcome emails and onboarding emails — not just your typical newsletter. Why? #10 Welcome emails are incredibly effective: on average, 320% more revenue is attributed to them on a per email basis than other promotional emails. It’s a known fact that it’s easier to earn more revenues from existing customers. However, a lot of companies don’t spend time nor allocate resources to create a great onboarding experience. It’s like after they start paying, they get left to fend for themselves. This is a huge waste of money and opportunity. After spending so much to acquire that customer, and you don’t have a proper onboarding setup, you’ll lose that customer quickly. Sending an email to another person is personal. It gives you access to their inbox — a place that they check every day. If you have a great relationship with your email list, they’ll be dying to open your emails.